Sharing knowledge, information, technology and practices across cultural and national boundaries has become a means to address critical global problems. As governments strive to improve public health and safety, protect the environment, respond to disasters, or promote international commerce, they are engaging in new kinds of knowledge sharing networks as mechanisms for regional and global collaboration. In her 2004 book, The New World Order, Anne Marie Slaughter describes these networks as a key feature of 21st century governance, arguing that the international system is not only one of formal relationships among sovereign states, but also of less formal links among public, private, and nonprofit entities that interact with each other on the basis of expertise and interest rather than formal power. These networks rely heavily on informal interaction, persuasion, and information and require new kinds of knowledge sharing and information systems that combine both social and technical dimensions. A fundamental challenge for transnational knowledge networking is that every participant comes to the engagement deeply embedded in layers of context. Every participant, whether an individual or an organization, communicates, acts, and understands the world through well-established, contextual lenses. These lenses can be conceived as three layers of context that reflect national culture and political systems, a wide array of organizational factors, and the characteristics of the technology, data, and expertise they share. Much of the work of a transnational network is embodied in the effort to bridge or shrink “contextual distances” so that the participants can create shared meaning and productive collaborations. 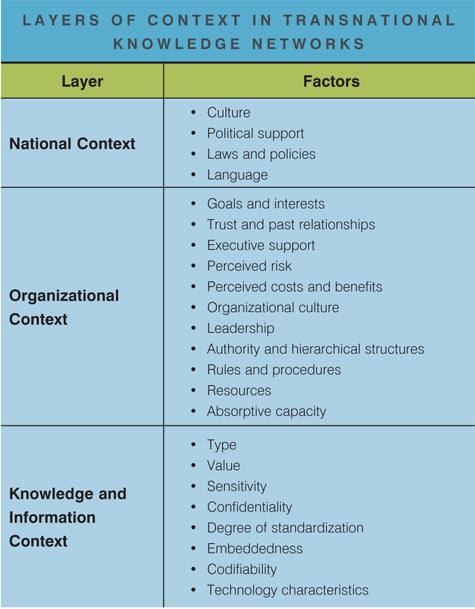 Preliminary findings from a recent CTG research project, funded by the US National Science Foundation, shed light on critical contextual factors that may hinder or enhance the performance of Transnational Public Sector Knowledge Networks (TPSKNs). The research involved analysis of the first-hand experiences of government and partner organizations in China and the United States who are working together on air quality issues. 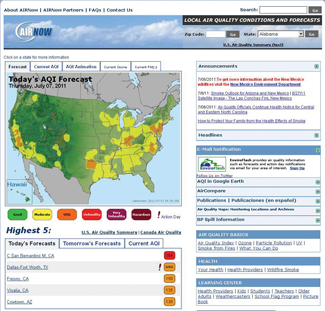 AIRNow-International (AIRNow-I) is an initiative led by the US Environmental Protection Agency (EPA) to redesign the US air quality monitoring and public reporting system to be scalable, interoperable, portable, and affordable to any country. Its guiding vision is a readily usable worldwide platform for gathering, analyzing, and sharing air quality information to improve public health. Our case study assessed the internationalization of AIRNow through a collaborative project between EPA and the Shanghai Environmental Monitoring Center (SEMC) in China. We traced the history of air quality policy and management in both countries and then explored the structure and dynamics of their joint effort to build AIRNow-I Shanghai. Our goal was to understand the influences of the separate Chinese and American contexts on the participants and their interactions, and to identify the ways in which they dealt with important contextual distances to produce results. The AIRNow-I Shanghai project operated under the broad provisions of a bilateral ten-year cooperation agreement established in 2004. At that time, China was in the early stages of air quality policy development and emerging public awareness of environmental issues – similar to where the US had been in the 1960s and 70s. Despite the differences in policy development and experience, the project offered benefits to both countries. For EPA it was an opportunity to internationalize AIRNow in a way that would produce not only a platform for many different countries, but also a revamped system for the United States. For Shanghai, the project was a means to advance air quality monitoring and control in rapidly developing parts of China and to address new public policies concerning air pollution. The project faced considerable challenges from the start due to differences between the countries and organizations involved. Some of these differences reflect the divergent social, economic, and political contexts in the United States and China; others reflect differences in goals, organizational factors, typical approaches to work, technical capabilities and the resources available for the effort. The United States and China had different reasons for participating and sought different, but not necessarily incompatible, goals. For the US, it was a first effort to expand real-time air quality reporting for public use in a developing country; for China it was a means to advance air quality monitoring and management as an internal governmental function. 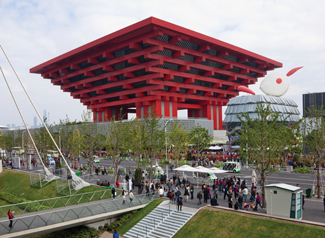 As part of the Shanghai Expo 2010, the US EPA and the Shanghai Environmental Protection Bureau (EPB) launched AIRNow International, with real-time air quality data reporting from the World Expo site. Political and organizational cultures also combined to create quite different contexts for the work in the two countries. For example, the US partners had a fair amount of discretion and long-standing relationships between the government and private sector contractors who carried out much of the work. By contrast, the Chinese partners worked within a tightly structured hierarchy building new relationships and understandings along the way . Language presented another challenge. Much work was done remotely and over the phone, few of the Chinese were comfortable with spoken English, and only one member of the American team was familiar with Mandarin. In addition, neither side started with enough money to support the work they wanted to do and neither country provided funding from regular operating budgets. Physical distance also imposed challenges, from crossing over 10-12 time zones to the expenses of travel for the face-to-face work that was necessary to design, build, test, and implement the system. Given these challenges, a long “courtship period” of technical exchanges and scientific visits helped build relationships that were essential in the eventual system development work. During this early period from 2004-2008, lacking sufficient political and financial support to move forward with system development, both sides committed some money and time to a series of technical exchanges where staff traveled between the China and the United States over a period of about three years, essentially sharing knowledge and information related to air quality reporting and forecasting. Participants in both countries characterized this period of exchanges as capacity building both in terms of technical knowledge and in learning more about one another as individual professionals. Most of the events could be narrowly viewed as knowledge transfer about forecasting from the United States to Shanghai. However, from a broader organizational and social perspective, the events also developed familiarity and the capability to work together, creating the foundations for personal relationships and a level of trust among the organizations involved. Joint work on system development finally began in April 2008 with the signing of a formal agreement laying out goals and responsibilities for the project, and both sides finding enough funding to go forward. Once the US and Shanghai teams moved into the development phase, a more focused and detailed working relationship began to emerge. The information and knowledge sharing that occurred during the previous several years helped them get to know each other as fellow scientists and technicians. However, trust, communication, and collaborative work processes still needed to evolve and mature as the work became more technical, specific, and results-driven. The participants had to learn how to actually work together across time, distance, and cultural differences. Information technology and collaboration tools helped bridge the language, cultural, and even physical distances. Email and remote demonstration software proved to be very important forms of communication because they put information into written or visual form where it was more likely to be understood in the same way by all. Personal commitments to constant communication, literal and cultural translation, and simple hospitality encouraged more trust and openness that helped in problem identification and problem solving. One American team member who was born in Hong Kong and the Chinese team leader who had spent months at a US research lab provided essential cross-cultural linkages across the two teams. For all, growing knowledge of practical conditions (such as the effects of rapid development and urbanization) and technical capabilities (such as the science of air quality forecasting) contributed to a more complete and nuanced understanding of the possibilities and the limitations of the project and to a successful outcome. AIRNow-I Shanghai made its official debut on May 10, 2010. EPA had spent approximately $1.5 million and China about RMB 900 thousand on the direct costs. Both sides had invested nearly six years in learning and relationship building as well as joint system development. Several months earlier the core system developed for AIRNow-I Shanghai had replaced the old domestic AIRNow software in the United States. China and Shanghai achieved a variety of important policy, management, and technology goals. These achievements included an air quality information monitoring, management, and reporting system for the city of Shanghai for which AIRNow-I is the core system; successful experimentation with a totally new international cooperation model; successful public use of the system during World Expo 2010 Shanghai; the cultivation of a well trained cross-functional team at SEMC; staff development and scientific training; and enhancement of Shanghai’s reputation for leadership in China. Accomplishments for the US included a new US domestic AIRNow system; a successful implementation of the AIRNow-I platform for global use; enhancement of EPA’s international leadership position in air quality monitoring and improvement; and deep on-the-ground experience working on a familiar topic in another culture. For both the United States and China, the project led to several important joint accomplishments such as tangible outcomes associated with the ten-year bilateral MOU; trusted working relationships and a technical basis for regional air quality strategies in China; and a variety of re-usable tools and techniques for communication and collaboration. Given the accomplishments as well as the challenges presented in this case, we offer these lessons for future engagements in transnational knowledge sharing. Consider the broad historical and political context. Efforts like AIRNow-I are not general exercises in international engagement. They are specific investments in a particular policy domain where the countries involved can be in different stages of development and pursuing different policy goals. Developing a shared understanding of similarities and differences in context and history should be among the first steps in these initiatives. Find the mutual benefit in separate national intentions. The nations participating in a transnational knowledge network are likely to have somewhat different intentions and goals. Success of the network depends on finding an adequate overlap among these different goals so that progress is made toward separate objectives, while at the same time achieving an acceptable level of mutual benefit. Give critical attention to the early phase of engagement. The cultural, political, organizational, technological and other differences among participants present many opportunities for misunderstanding and wrong assumptions. The early period of engagement is therefore critical for establishing shared understanding about fundamental goals, roles, expectations, capabilities, resource limitations, and working assumptions. Recognize the power of personal commitment and individual leadership. The individuals involved in complex transnational projects all have responsibilities associated with their organizational positions, but the success of these efforts is strongly linked to personal commitment and leadership that goes beyond formal position. These individual contributions are a necessary complement to organizational action. Recruit participants who can work in multiple languages and cultures. Transnational projects require at least some participants who speak multiple languages and are comfortable working in more than one culture. Ideally, these would be people who have lived and worked for substantial periods in these different contexts and appreciate how values, norms, and beliefs underlie perceptions, relationships, and actions. Employ multiple methods and channels of communication. Since the participants in a transnational network are likely to be separated by physical location as well as by time, language, and culture, the chances for miscommunication and non-communication are high. These risks can be mitigated by employing and coordinating multiple forms and channels of communication at the technical, managerial and policy levels. Be open to different forms of knowledge sharing and knowledge building. Transnational projects like AIRNow-I are not technology transfer projects in which a donor builds a factory or gives a complete system to a recipient. Rather, they are long term engagements in which two or more countries work together to create value in the form of knowledge, expertise, and shared results. This kind of work requires patience and genuine openness to a mutual learning process. Assemble complementary, adequate, and appropriate resources. Many kinds of resources go into transnational knowledge sharing projects, including expertise, data, funding, technology, facilities, and relationships. In a successful effort, each participating entity brings some collection of resources to the table that are commensurate with both its own interests and its commitment to the network goals. Different funding sources, rules, and cycles can make this difficult, but not impossible, to achieve. Plan the duration and intensity of the effort for the “distance” to be covered. Transnational knowledge sharing appears to need a long gestation period of relationship building before explicit goals are set or projects are launched. Once underway, the work of the network is inevitably slowed by differences in location, language, culture, and political and organizational considerations. When these differences are large, the time period for achieving sustainable results is likely to be measured in years rather than weeks or months. Build in a path to sustainability. To achieve long lasting mutual benefits, the plan for any transnational knowledge sharing project needs to include a path to sustainability that makes sense in the context of that particular effort. A rough strategy and resource estimate for sustaining the effort should be part of the plan. Consider the broad historical and political context. Express clear national intentions while seeking mutual benefits. Give critical attention to the early phase of engagement. Recognize the power of personal commitment and individual leadership. Recruit participants who can work in multiple languages and cultures. Employ multiple methods and channels of communication. Be open to different forms of knowledge sharing and knowledge building. Assemble complementary, adequate, and appropriate resources. Plan the duration and intensity of the effort for the “distance” to be covered. Build in a path to sustainability. The world faces a growing number of regional and global problems that no nation has the authority, capability, or resources to solve on its own. Our study of TPSKNs shows how sovereignty, unique cultural characteristics, and national contexts introduce conflicts and distances that complicate transnational cooperation. We have learned that while governments are the essential core of these networks, successful ones often include non-government partners such as private firms, civil society groups, and research institutions. Effective TPSKNs need time to develop, rich communication, and a basis for trust among the participants. When these factors are present, these multi-faceted networks can use a variety of formal and informal means to foster learning, collaboration, and problem solving.